will call you back within 20 minutes Thank you! 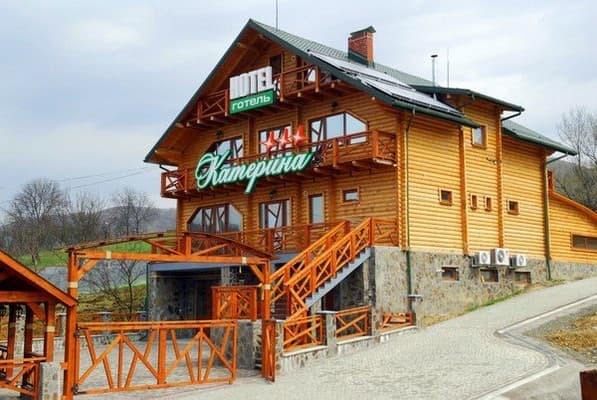 Hotel "Katerina" is located in the center of the balneological resort of Polyana village, 12 km from the district center of Svalyava. 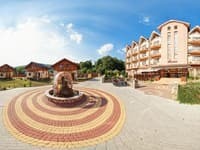 The hotel is surrounded by a recreational Carpathian forest park with sources of healing mineral water Polyana Kvasova. 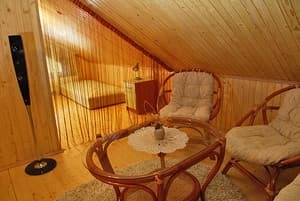 The Katerina Hotel is an elite four-story building of 6 rooms, which can accommodate up to 14 guests at a time. Clients of the Katerina Hotel are offered accommodation in cozy rooms of various categories with air conditioning, TV, cable TV and free Wi-Fi. 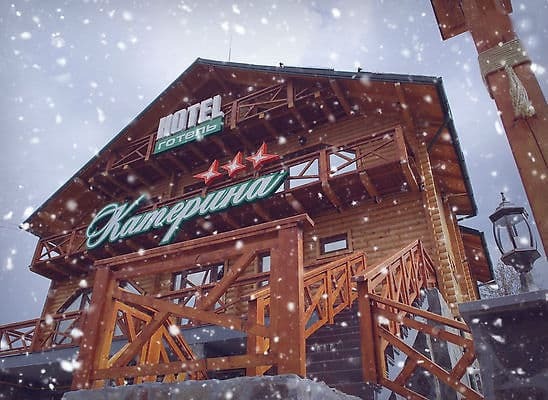 The hotel is decorated in the style of a log cabin, has an indoor pool, a Russian wood-heated bath, and an “Ofuro” vat, which is located outdoors by the ornamental lake. The hotel has a cafe where you can taste traditional Transcarpathian dishes. Breakfast can be served in the room. The distance to the nearest ski lift is 20 m.
No commission! We do not charge a commission for processing and processing of the reservation. Hotels24.ua services are completely free! Description of the room: Double bed, wardrobe, bathroom (washbasin, bidet, shower), TV, DVD, internal telephone, air conditioning, balcony. 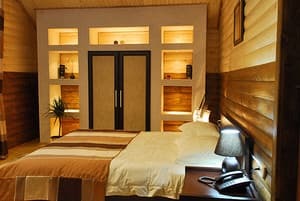 Description of the room: Large spacious room 39 sq. M. The room has an extra bed for the child. Double bed, furniture from the vine, baby cot, bathroom (bath, bidet, washbasin). TV, DVD, telephone, air conditioning, balcony. Description of the room: Double superior room with a large double bed and a balcony. Thank you for your application. We will call you back in the near future. Please try again later or call 067 510-15-04. Неравнодушный персонал. На этом позитивные позитивные моменты заканчиваются. Все кроме персонала. Убитое, запущенное место в котором нет хозяина. These are general hotel policies, they may vary per room type; Please check the description of your room. Check arrival: from 13:00 - 14:00 hours. Check leaving: to 10:00 - 11:00 hours. Children under 6 years old are accommodated free of charge without additional space. When placing children under 2 years old in cots, they are provided free of charge. Extra bed - 200 UAH. On the territory there is a restaurant. The hotel is located in the center of the balneological resort of Polyana village. The central part of the village, 20 m to the ski lift, 300 m to the village council, 1 km to the sanatorium "Polyana", 800 m to the mineral spring "Polyana Kupel". The hotel is located a 3-minute walk from the Polyana bus stop, from where you can reach the Svalyava railway station. A transfer to Uzhgorod International Airport is also organized.